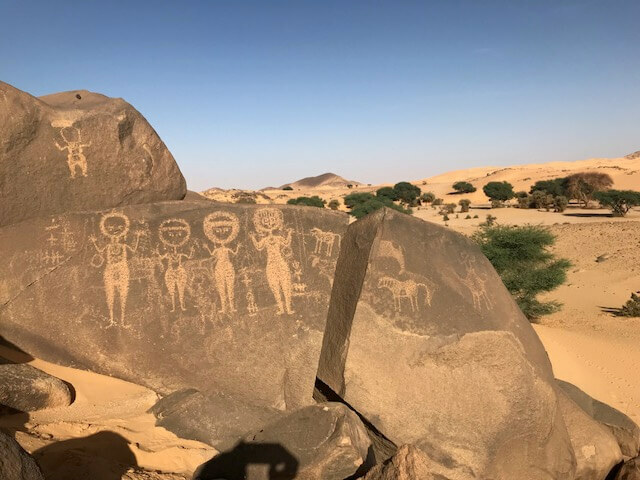 In early November 2018, TARA’s David Coulson took a group of 8 people on a Rock Art Safari in Niger’s Air Mountains in the Southern Sahara, an area where the Trust has been documenting art since the mid 1990s. 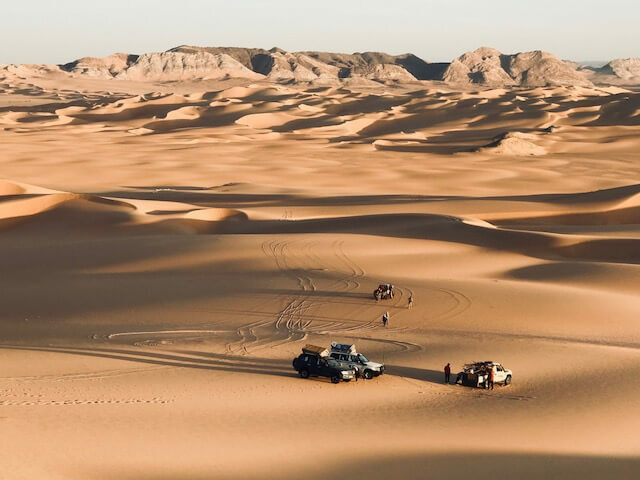 The group arrived by air from Niger’s capital, at the picturesque town of Agadez, once known as the Gateway to the Sahara. The land expedition with 5 Landcruisers left the following morning and arrived that afternoon at Dabous, the Big Giraffe site which TARA put on the world map in 1997. 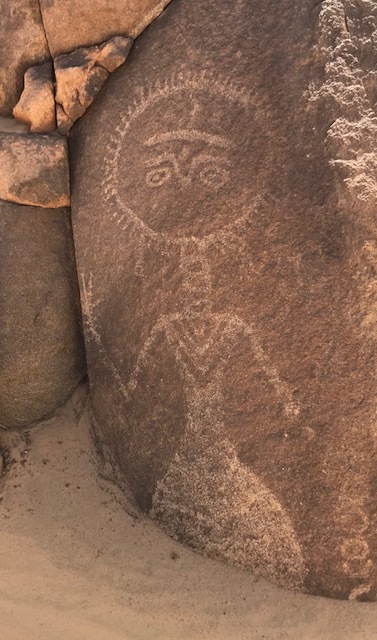 When David first recorded these giant 7000 year old carvings, the news went viral. At a press conference held at National Geographic in 1998 the giraffes were described as one of the greatest pieces of prehistoric art ever found. 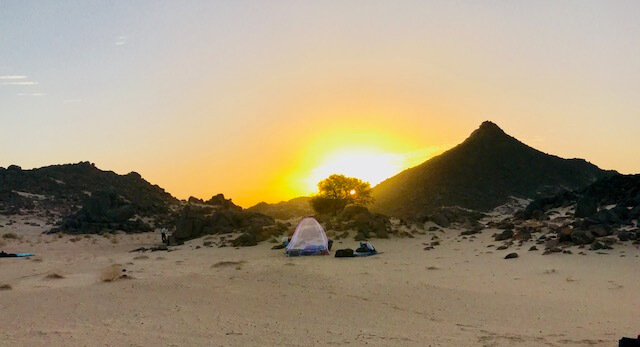 When the group arrived at the Dabous site on Nov 1st about 100 Tuareg, many mounted on camels, came thundering across the ancient lake-bed in their finery hooting a “Royal” welcome to a our group. Meanwhile the women gathered in circles clapping and chanting . 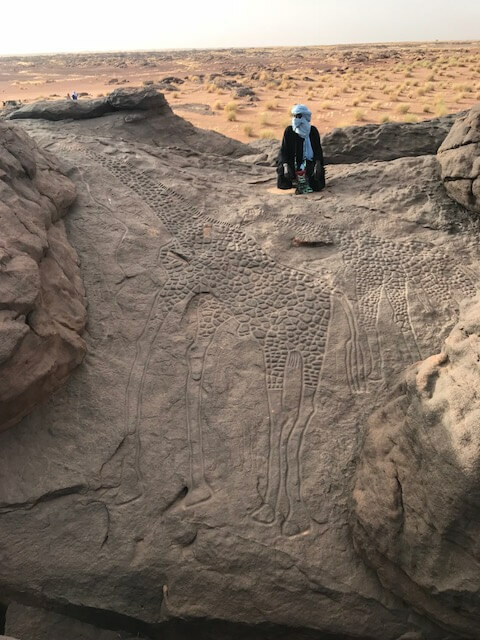 During the week that followed, David and his old friend Rhissa Agboulah (now Minister for Security) took the group on a grand tour of about 800 kilometres through spectacular mountains and dunes north east of Dabous, visiting many wonderful engraving sites. 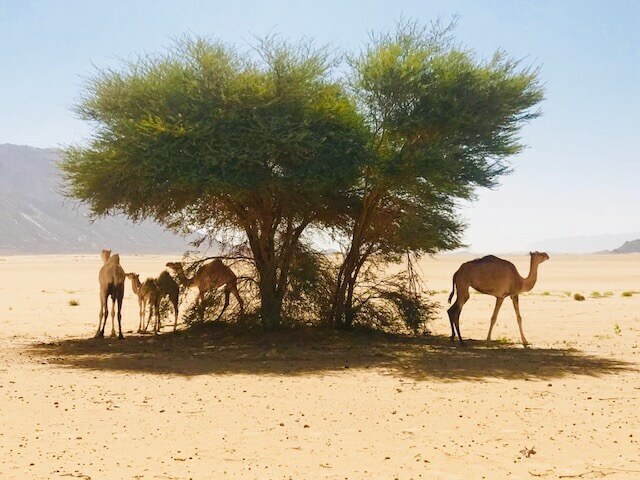 During this trip they saw only one human being, a 12 year old Tuareg boy who had been sent on a 59 km hike to check on some camels. 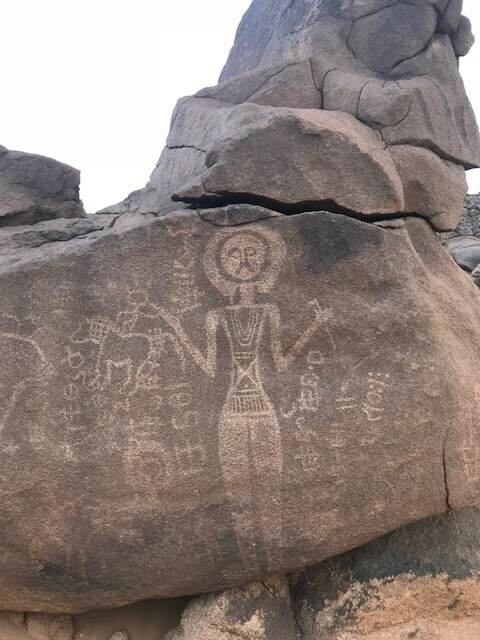 Many of the Air engravings feature alien-looking warriors probably made between 2000 and 3000 years ago. 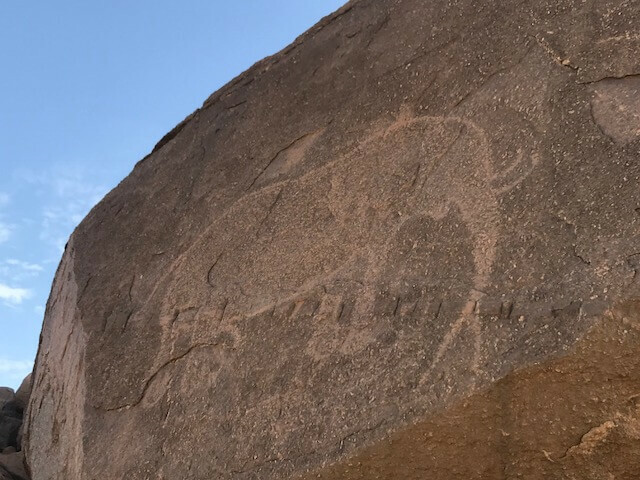 During the trip, David was able to document a number of new rock engraving sites (see images below) which they found to add to TARA’s archive, much of which is accessible as part of the British Museums global online collections. These safaris offer an opportunity to record new art. TARA will be taking another group to the same region in 2019. 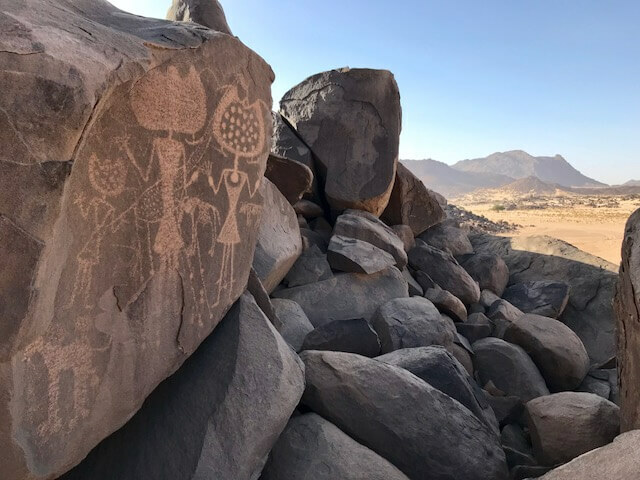 Anyone interested in joining this trip should contact David Coulson directly (david@africanrockart.org) or his assistant, eunice@africanrockart.org.